Hello. I have Onkyo TX-NR818 and a problem with harsh sounding highs after Audyssey calibration. I've tried different Audyssey mic (I had it for a day only, so cannot try anything more with it) and the results was much much better, so I am dealing with Onkyo warranty currently about replacing the mic. This is the measurement of the center channel that was detected as 50 Hz, and receiver set the crossover at this position. I reset it back to full-range to see what Audyssey does in isolation without receivers HPF more clearly. As the 50 Hz is detected as the lowest speaker frequency and Audyssey is not supposed to correct bellow that frequency, the graphs with and without Audyssey should match below this frequency, but there is a boost of more than 10 dB below 50 Hz. Do you think the defective mic. could make the Audyssey to this misbehavior somehow? If not, what could be the reason? Is Dynamic EQ on when you are making this measurement? Ensured one more time that Dynamic EQ (and Dyn. Volume etc.) is off, but it is pretty clear already with no-Audyssey curve. So, the question again, can this be in any way caused by measuring with defective mic, or is it clear that the device is not functioning as it should? I believe that the boost you are seeing at low frequencies is because of the need to match the Audyssey On case to the Audyssey Off case in level. There is a normalization process that is applied to make sure that the on-off levels are as close as possible. There is no equalization happening below 50 Hz. This is not due to the mic. If the mic has problems they would show up in the high frequencies. In any case, Audyssey recommends setting all speakers to Small so that the low frequencies are properly handled by the subwoofer. Isn't it that the After-Audyssey level should be matched to the same level that was before Audyssey, in other words isn't the weighted level detected by the Aydyssey is the level that is set to the receiver and then it tries to correct everything to this same level?... Anyway if there is some difference with weighting the 10 dB is way too much. Also the speaker in the last graph is detected as 100 Hz, so there should be no correction bellow 100 Hz, but there is quite obvious one... I really don't think this is the correct behavior, If audibly I hear the same level but with room EQ on there are 10 dB (100 times the power!!!) added to the frequencies below what my speakers are capable - this is scaring, and this is against your other answers here that Audyssey wont apply any correction and boost the frequencies below the detected frequency to protect speakers. The stopping of correction below the roll off frequency is not immediate. It is gradual to match the slope of the speaker roll off. Your graphs are quite typical and I don't see any issues with the low frequency behavior. The level calculation is not easily seen in your graphs. It requires a calculation of the perceived level of loudness (there is a psychoacoustic model involved) to appropriately weight each frequency. I'm sorry you think I am trying to find obscure reasons. This is not the case. I can't easily do the integration and weighting in my head, but to my eye it looks like the energy below the red curve is being matched to the energy under the black curve (considering the large dip in the midbass). I don't have any other possible explanation. I have never seen an issue with our mic in the low frequency range. I have seen issues in the high frequencies only that are caused by exposure to humidity or static electricity. It doesn't appear to be the case here. 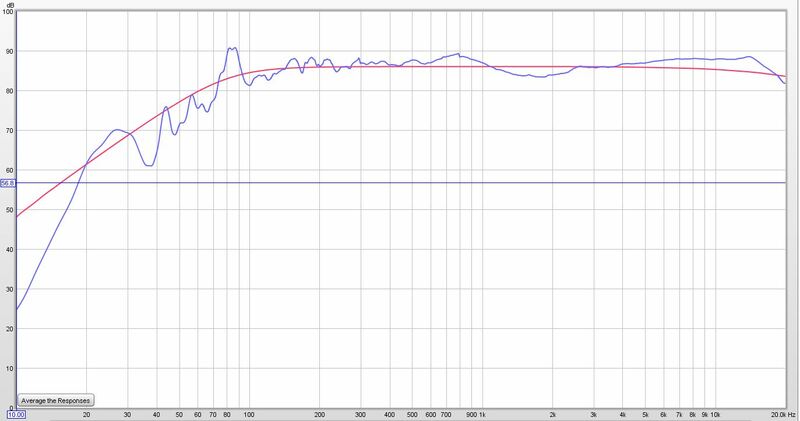 What I see very strange on the acoustical curves is that the Audyssey somehow ignore correcting problems in the middle range between 400 Hz and 1.2 kHz. The problems there are quite obvious (6 dB fluctuations) and, most importantly, the acoustical response don't vary significantly depending on the measurement point in the room. But somehow Audyssey thinks they are not a problem. So my theory is that it sees larger problems somewhere and spends all power correcting them (imagine dancing particles on the mic membrane). And this middle range and low-frequencies are just thrown out of the matrix... I don't know internals if the Audyssey, it is a pure speculation based on what I observe on the graphs, but it could explain why damaged mic can cause some unwanted and unexpected artifacts in presence of some problems not in the range where the actual problem happens and together with some bug with deciding what problems are "more important". It's difficult to judge acoustical performance from a single point measurement. You have to take multiple positions and then perform a spatial RMS average to get a better idea of what is going on. I don't think it's ignoring the 400-1200 Hz range. It's making decisions on what peaks and dips to go after based on a weighted combination of the measurements. If you place your mic in the same spots as the Audyssey mic and then average your measurements you may get a better idea of what is really happening. Below the roll off frequency the Audyssey is mostly attenuating, this is pretty acceptable way of what you say "The stopping of correction below the roll off frequency is not immediate.". Only small spikes of boost that are not more than 3 dB can be seen bellow the roll-off frequency - this is what should be called the ordinary and usual and correct behavior - it doesn't affect the sound quality as with my case and heavy boost under the roll off frequency. As I've had successful good sounding calibration with another Audyssey mic there is some probability that replacing the supplied mic will solve the problem, but I am not so sure, and even if the defective mic is triggered such strange behavior, I think it should be interesting for you to investigate the reasons as this could be related to the case with many people claim the sound is harsh after Audyssey. I will be happy to send you a new microphone to try if you send me your mailing address. You can email me directly at chris@audyssey.com. Our office is closed this week, but I will make sure it is sent out next week. Hi again. Good new is that I have Received the mic. and there are some sonic improvements. At least now I can listen to some scenes at reference level that I was not able to do before without fear for tweeters or my ears will explode. All this is with crossovers moved to 80Hz where the receiver has set them lower. Bad news is that measurements still impartially telling not much has improved. While boost for fronts has improved from 10dB to around 6dB, the center and surround still has 10dB boost as before. I did 3х times measurement at MLP so, no averaging between measurement points is affecting the graphs. I left crossovers in electrical measurements as they were set with AVR, but acoustical measurements are "full-range". After reading some historical 2009 talks on AVSForums I understood what you meant by normalization in this context, at first I have a right thought about it but thrown it out immediately as it looked to me completely absurd, as in this case what happens is that Audyssey finds F3, then builds a correcting filter that does it's thing by attenuating absolutely everything above this F3, but it seems it is what happens and logically it needs level matching again (I was assuming it correcting to the weighted average that was already set as level). So, if we attenuating the range above F3, then gain-match everything back then we have net result of boosting range below F3 and that is definitely a bug, whatever has caused this. As far as I understand from your comments this bug should have been fixed back in the 2009, but it is happening now, with 2012 receiver model... Do you have any more information on this, is it going to be fixed or not? 10dB is pretty much to tolerate, especially in the most demanding frequency range, 10 dB is 10 times the power, pretty much it is like cutting power of amplifier and speakers 10 times once Audyssey is enabled. Moving the crossovers higher is a poor workaround and not a solution as they and the sub are designed to improve the sound further, and not just bring it back after Audyssey has spoiled it. It's not a bug. There is a lot more going on. The maximum boost that MultEQ allows is 9 dB. Below the roll off point it gradually stops applying that for EQ, but MultEQ is also trying to match the roll off slope of the speaker to be 4th order (acoustically). So, it may boost to achieve that. This is required in order to better prepare the speaker response for the slope that the bass management system requires. At 50 Hz your speaker response is quite far down. So, a 9 dB boost there will not cause any problems. From the graphs it looks more like it tries to match the slope to 1th order acoustically... And really I can see a few points that are above 9 dB (up to 12dB higher than corresponding no-audyssey curve). I do not understand what has changed to this world where the basic acoustic principles doesn't matter anymore and when there is obvious bug still some excuses are trying to be found. I repeated it many times and will tell it again - correcting acoustical roll-off is nonsense (there are few exceptions but those are specially designed very-high-power amps and very-high-area very-high-excursion woofers, etc. - this is not nearly our generic case), for the 10dB case it will scarify the power of amp and speakers by an order of magnitude, doing this for delusive reason of [possibly] better matching with subwoofer does not justify the price. I would tolerate something like 3dB there, not more, this is already the hardest range for the limited capability speakers. For those who wants better match with the sub there is always path to increase crossover point above the lowest frequency. This is the whole idea of bass management - put away the hardest work near the edge of speaker capabilities to the sub. Increasing it to 80Hz is what you are recommending anyway. What Aydyssey does is brings everything back negating the improvement. And for those who have no subwoofers - this is simply dangerous for their speakers. Or will it exclude the "rolloff compensation" if there is no sub in the system? Anyway, this is very strange way to do things. First you claim Audyssey does not correct and does not boost below F3 (what is most logical, and understandably it doesn't stop correction immediately, but it should be somehow observable), and then finding excuses one after another why it actually does this. I've been following Igor's posts at AVS and Onkyo Support forums and I'm getting a lot of high end shrillness/hissing/distortion on the NR818. I'm a long time user and never had any problems with my room/speaker setup before using MultEQ on a TX707. I've tried calibrating with the ACM1HB and 3 other ACM1H mics I have and it's definitely not in the mics as they all come back with the same boosted highs. As Igor referenced there was a problem in '09 with the initial implementation of XT32 in the Onkyo line, could this be true now with the 818? Yes, all the tweeters are working fine. I'm using a pair of vintage (1999) Polk RTA11t towers as fronts and the center, wides, dipole surrounds are all from the recent (Rti series) production that Polkies recommend as a good match with the older front tweeters. And they do seem to timbre match well on pans. Since I last posted I've raised the front speakers an inch and a half so that the tweeter is now 31 inches high and the mic, at ear level, is at 37 inches. I sit 15 feet from the fronts. Ran setup and the results are better, not as strident and a lot of the hissy-ness has been tamed. I may try and raise them another inch or so to get them even closer. It seems that XT32, as many people have suggested on the AVS forum, is more finicky about placement and in my case that may have been the whole problem. Another instance of operator error. Sounds like your tweeters may have some high frequency roll off as you go off axis. This would tell the MultEQ filters to boost more than necessary. All tweeters do this, but some more than others. A tighter measurement pattern and tweeter pointing should help. Hi Chris, I still want to point you back to the issue with over-boosted frequencies bellow F3. You tell that it is matching for 4th order acoustic slope. Even if you meant this 4th order is assuming HPF roll off receiver's bass management, it still should be 2th order by itself (but I understand you that it should be 4th order without assuming bass management cut at that frequency). Still, even assuming 2th order it is not the case in my graphs as it clearly boosting it to 6 dB / octave meaning 1st order (and it probably would boost even more if there were no limit of boosting). This all suggesting there is a bug in the XT32 implementation on 818. Probably it is not happening in all conditions, but it is pretty stable happening in my environment. And still I think there is no any excuse for boosting below F3 under any circumstances, and I have simple suggestion here, there is quite simple solution to do it safe - you can just move estimated F3 a bit higher so that the desired slope will be matched without need for boost, and as long as roll off is down 6-10dB there is really no need for matching below that as it is passed already to subwoofer if it is present in the system, and if it is not - trying to extend LF range by EQ is dangerous anyway. Pretty much if Audyssey sees huge roll off below F3 it can assume that it is because of the range is already extended by the room. Thanks for your comments. We will study them to understand what's going on. We have been unable to reproduce this.